Do you have a tendency to label things good and bad in your life? Or even better, right and wrong? When my first marriage ended, I hurt so much I was in physical pain. This was ‘Bad’ beyond words. I’d had a big white wedding, moved to Scotland to start the dream life and we hadn’t even opened all the presents before the ‘bad’ started to appear. The questions, the accusations, the blame, the depression. The days and nights crying. The months (OK, years) on a sofa wondering how it could have all gone ‘wrong’ and when there would be ‘good’ again. You’ve had your moment like this. I don’t know what it is and you’ve had it. We all do. What if I were to say to you, you can UNLOCK SO MUCH MORE with a different perspective? Oh ladies, we love CATEGORISING don’t we? You know, putting things in boxes, all neat and tidy so that we’re clear where we stand. If we change our relationship with our good and bad thoughts, we can really create a shift in our lives. Let me explain, because recently it has become even clearer to me than ever that if we change our relationship with our good and bad thoughts, we can really create a shift in our lives. Every time I step into a coaching session, it becomes clearer and clearer that good and bad and right and wrong are powerful labels. They create thoughts that lead to judgements. And when we get on the bandwagon of judging, well, we tend to create some pickles in our lives. ‘This is good’ becomes, ‘I’m OK, everything is working out how I want it to. It’s all going in the right direction. This is what I want. MORE, MORE, MORE please!’. ‘This is bad’ becomes, ‘I’m NOT ok. Why is this happening to me? Something needs to change. This is NOT what I want. STOP THIS RIGHT NOW!’. I bet even reading that you felt the desire to create more and to HANG ON to what is on the good stuff and the panic rising in the bad, even though NONE OF IT IS ACTUALLY HAPPENING TO YOU. They’re just sentences I wrote on a page. See how powerful they are? Of course, it’s human to have a preference. Who wouldn’t like more good news in their life than bad news? And THIS. By creating labels of good or bad, we create a WHOLE narrative (and subsequent emotions and thoughts) which are not only less than helpful, they PROBABLY AREN’T EVEN TRUE. They create a sense of reality, ‘This is a bad day because I didn’t do cardio’, sets off a whole chain reaction on the other things we haven’t done or the made up consequences of one missed session and before we know it, the Crazy Lady inside is having a fine old day screaming at us. When our truth was, we made a decision that felt right at the time. AND THE DECISION HAS BEEN MADE. It’s done. We are obsessed with only having good days. It’s like we’ve bought into the Pollyanna Positivity Pill (I think we’ll market that later, sounds good…) that says, ‘if I pretend everything is wonderful every day, then it will be’. Chasing only ‘good’ days, can lead us to create roller coaster lives. Lives of boom and bust. Good, good, GOOOOOOD, bad, bad, BAAAAAAD. This is not fun friends. When we create false realities, eventually there’s going to be a crash. It’s inevitable. Because we’re hiding from what is and sugar coating it and not BEING WITH IT and seeing what it has to offer. We’re chasing good experiences or airbrushing our lives to pretend that they are ‘good’. And with that we can create emptiness, a lack of authenticity, a belief that we have to always show up happy for people to be acceptable. We can become paralysed by indecision when we get caught up with ‘what if this isn’t sustainable? Maybe I should plan for it TO GO WRONG’ and there we are again, whirring away in anxiety about the future. It hits us SO hard when we are sure we made a ‘good’ decision and suddenly it turns ‘bad’. You might even be the one who waited carefully and patiently for JUST the right man, marrying in your thirties, only to find yourself heading for divorce anyway two years later. You could have been the one who dreamed for years about earning lots of money in your life, finally getting financially secure and realising you’ve never felt less stable. Constantly worrying if you can maintain it. Or who you would be if you lost it. The point is, it’s ALWAYS changing. Every minute of the day. What if you not getting what you wanted turned out to be the most perfect thing of all? What if within every shadow, there could also be light? Sometimes we forget that our biggest learnings come from the dark times. That the things that created the most joyful shifts in our lives came from the bleakest moments. Years ago when I felt like I was drowning in post-divorce depression, I suddenly realised that NO-ONE was coming to rescue me. Instead of that becoming a ‘Bad’ thing (you know, it didn’t feel so hunky dory at the time), I learned the power and strength of being vulnerable and what happens when you don’t show up perfect and simply ask for help. My life is enhanced DAILY as a result of this shift that could never have happened without the dark night of the soul that created it. If we try to navigate our life by actively choosing to side step experiences that feel ‘hard’ or ‘bad’, then we will MISS these moments that create transformation. That elevate our lives to an entirely new level. Sometimes relationships HAVE TO BREAK in order for us to find ourselves. Sometimes we need to LOSE OUR JOB to create the space to discover what we really love. And when we find those pivotal changes, we get to see that ‘Bad’ wasn’t ‘Bad’ after all. That ‘Bad’ was just as capable of creating magnificence in our lives as ‘Good’. Maybe even more so. Dropping it is this simple. What if we just played with WHAT IS? What if we didn’t label it anything? What if we just decide to live our lives as though everything is unfolding and that all we ever have to do is show up and be with it. In doing that, we’d know that everything that happens, however it looks, is just the next step on the yellow brick road. Of course we might meet some wicked witches along the way, maybe a tin man or two, and we’d still be ok. More OK than we could ever be if we allowed ourselves to get lost in the jungle of ‘bad’ and the paradise of ‘good’. What if life is SUPPOSED to be a blend of everything? 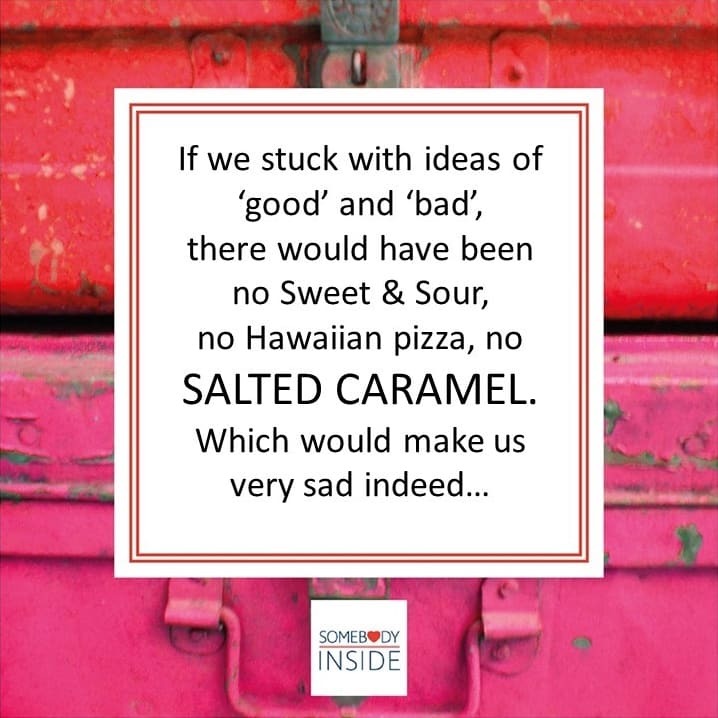 Like sweet and sour Chinese or even Salted Caramel (no-one would EVER have created that combination if we stuck with our good and bad judgements – and we happen to think that would be a very sad thing indeed!). Your life is a rich tapestry. The NOT knowing, the unfolding, it makes it what it is. It is what shapes you. It is what makes you, you. Every path has pain, joy, rough and tumble, dancing and skipping. Without the dark, the light has no impact or purpose. The vibrancy is in the contrast. Nothing in this life is certain my friends. It’s how you RELATE to that knowing that changes everything. What if we didn’t see that as good or bad either? Fantastic post! It is amazing how heavy or light words can make you feel at any time. It’s how you relate to any given circumstance that allows your growth and the fullness of this truly spectacular life.